Subject-specific, or personalised, modelling is one of the main targets in current cardiac modelling research. 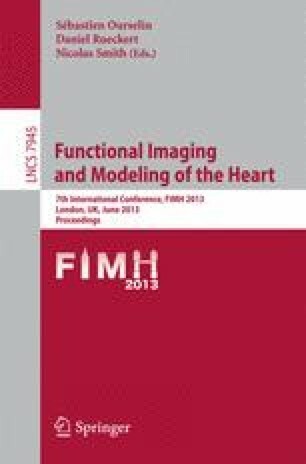 The aim of this study is to assess the improvement in predictive power gained by introducing subject-specific fibre models within an electromechanical model of left ventricular contraction in rat. A quantitative comparison of a series of global rule-based fibre models with an image-based locally optimised fibre model was performed. Our results show small difference in the predicted values of ejection fraction, wall thickening and base-to-apex shortening between the fibre models considered. In comparison, much larger differences appear between predicted values and those measured in experimental images. Further study of the constitutive behaviour and architecture of cardiac tissue is required before electromechanical models can fully benefit from the introduction of subject-specific fibres. Additionally, our study shows that, in the current model, an orthotropic description of the tissue is preferable to a transversely isotropic one, for the metrics considered.